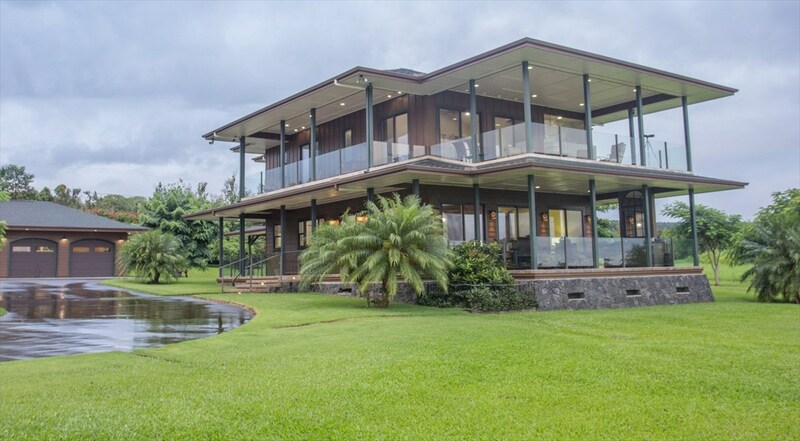 An elegant residence, over 5 acres of park-like manicured yards, the view of a lifetime - all within Hilo city limits. 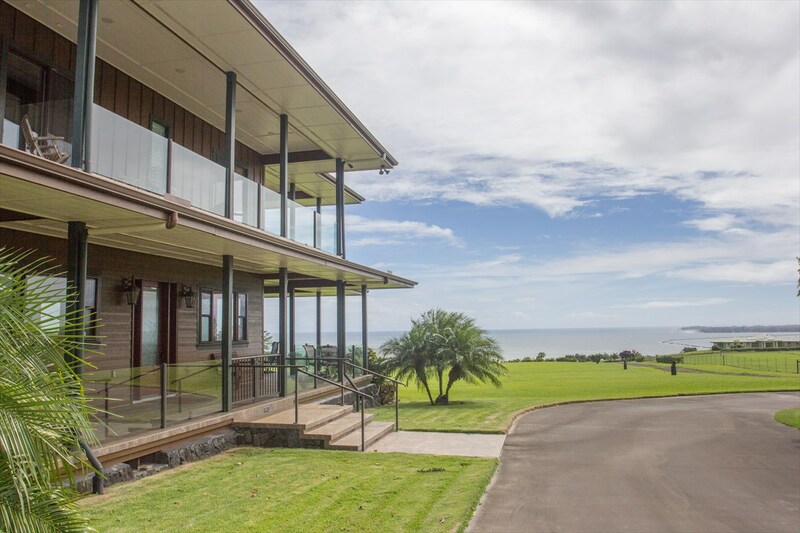 The home with wrap-around lanais offers unobstructed views of Hilo Bay and Pacific sunrises beyond. In the evenings, watch cruise ships exiting the bay, and airplanes taking off and landing at Hilo airport. Enjoy these wonders right from your home, privately, every day. 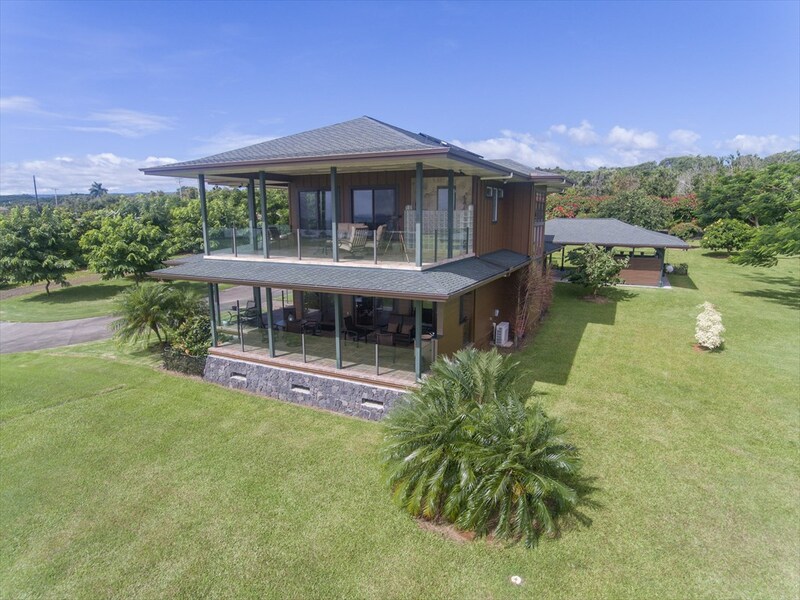 Thoughtfully designed to take full advantage of the view, this 2759 sf home has 3 bedrooms & 3 baths in the main home plus 1549 sf of lanais. 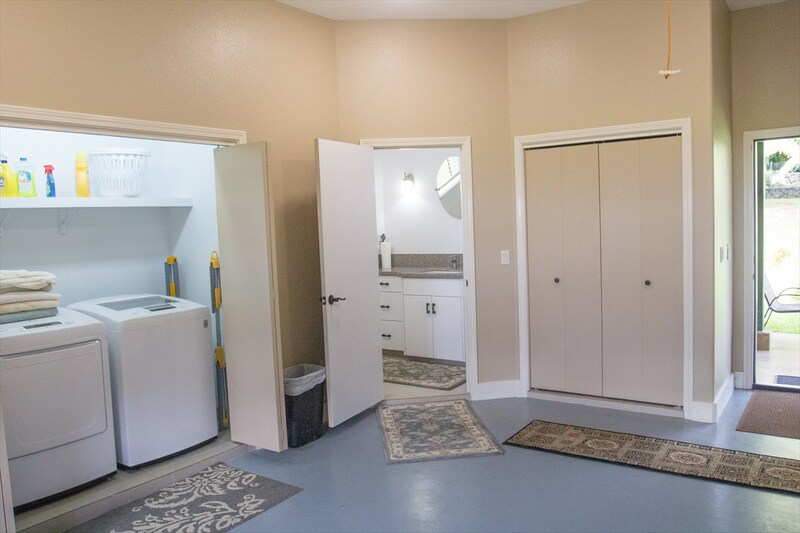 The 3-car garage has a bathroom, outside shower, and 2nd washer & dryer. Plans are included with the sale for expansion of this building, should additional living space be desired. Throughout the home you will note expert construction with the finest materials. 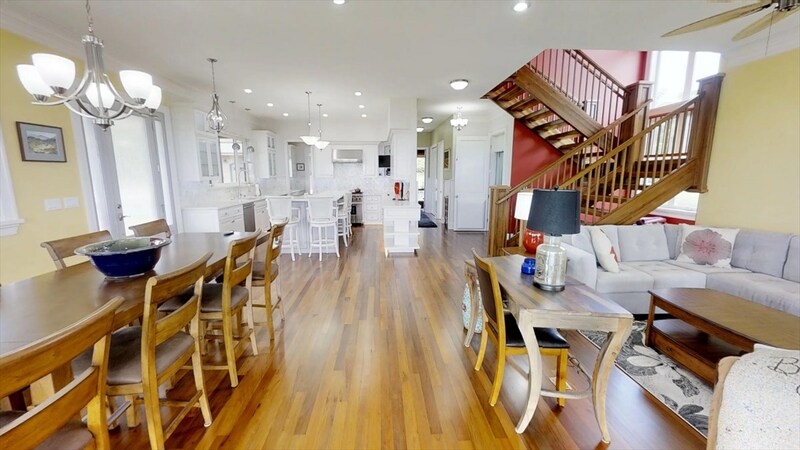 The open-concept interior has Ohia hardwood flooring below and high ceilings, crown molding and recessed lights above. The kitchen is a dream for any chef. A butler’s pantry with wall-to-wall storage keeps prep out of sight of guests. Like company in the kitchen? An enormous island comfortably seats 4. 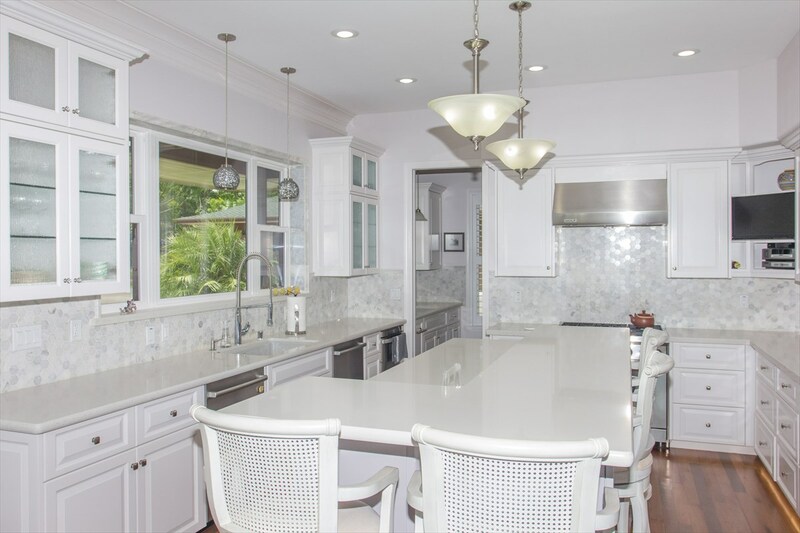 Quartz counters, marble tile back splashes, a Wolf 6 burner gas range, 2 stainless steel Bosch dishwashers and refrigerator drawers, 2 deep sinks and custom cabinetry make the room ideal. Look further. Step onto the 1st floor lanai with a wet bar and wine fridge. Also on the 1st floor is the great room, a full bathroom with bubbler tub, an ornate wooden staircase, and a spacious multi-person elevator. 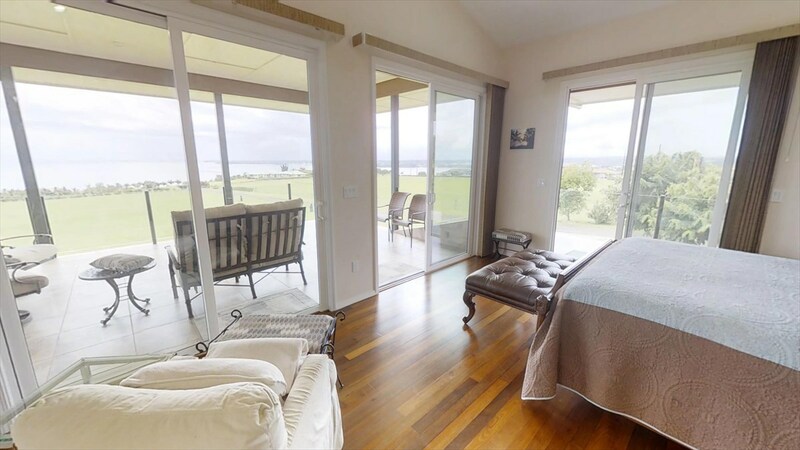 Upstairs is the master bedroom with private ocean view lanai, walk-in closet and cathedral ceilings. 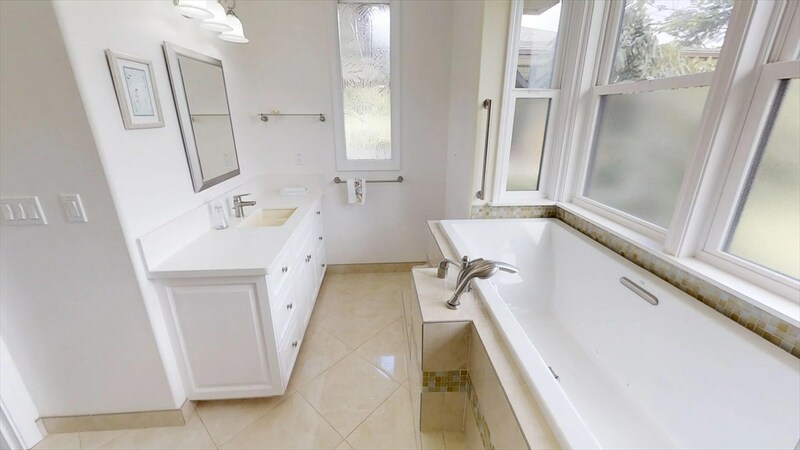 The master bath has a double vanity, and an open-air shower! 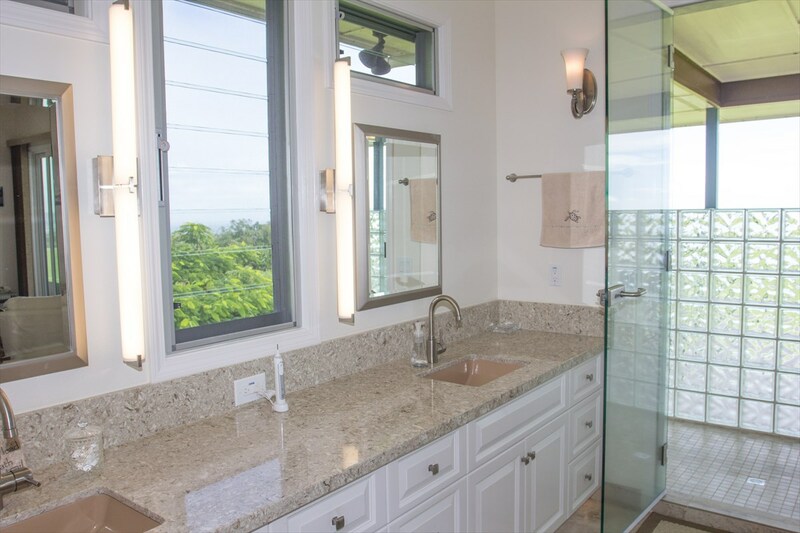 Why not enjoy the tropical air and the panoramic view while showering? Down the hall is a beautiful laundry room and 2 more bedrooms with a Jack-and-Jill bath. Majestic Mauna Kea, seasonally snow topped, is seen in the distance. 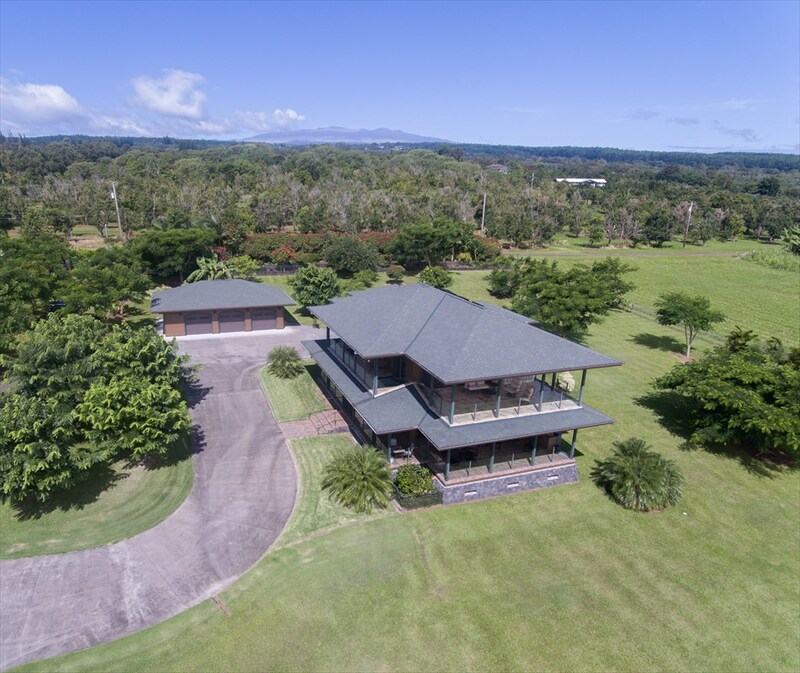 A country estate in Hilo, minutes from downtown, dining & hospital. Welcome home! An elegant residence, 5 acres of park-like manicured yards, and the view of a lifetime. 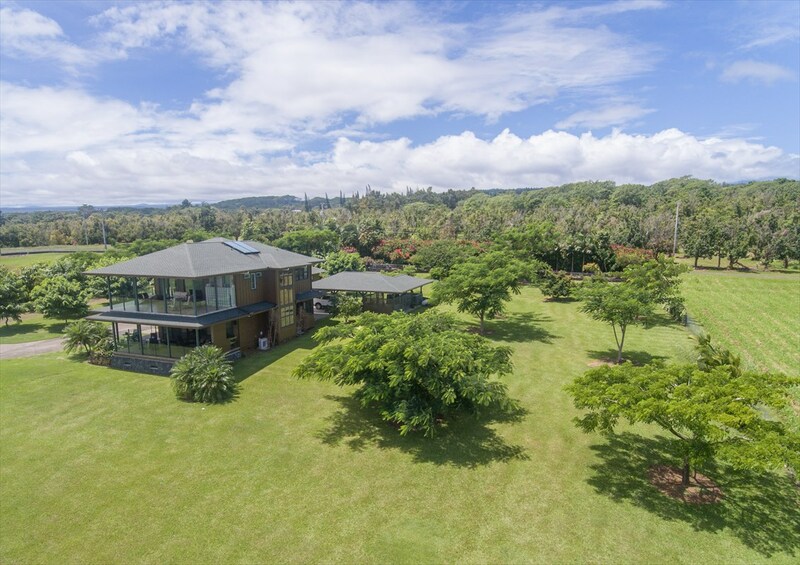 Inside Hilo city limits, minutes from downtown. 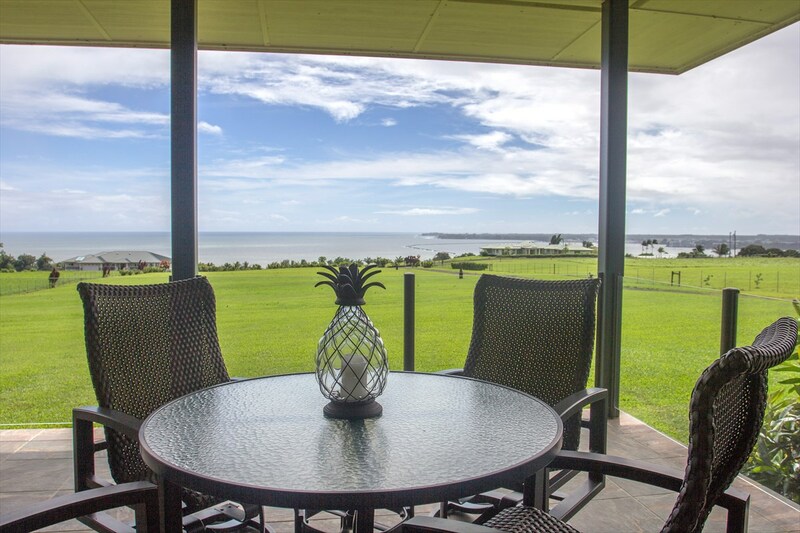 From the home and the wrap-around lanais enjoy the unobstructed views of Hilo Bay and Pacific sunrises beyond. Landscaped with ornamental and fruit-bearing tropical trees. The interior is open-concept with Ohia hardwood flooring below and high ceilings with crown molding and recessed lights above. Throughout the home you will note expert construction with the finest materials. In the evenings, watch the show of cruise ships exiting the bay, and airplanes taking off and landing at Hilo airport. The kitchen is a dream for any level of chef. A butler's pantry with wall-to-wall storage keeps prep out of sight of guests. An enormous island comfortably seats 4. 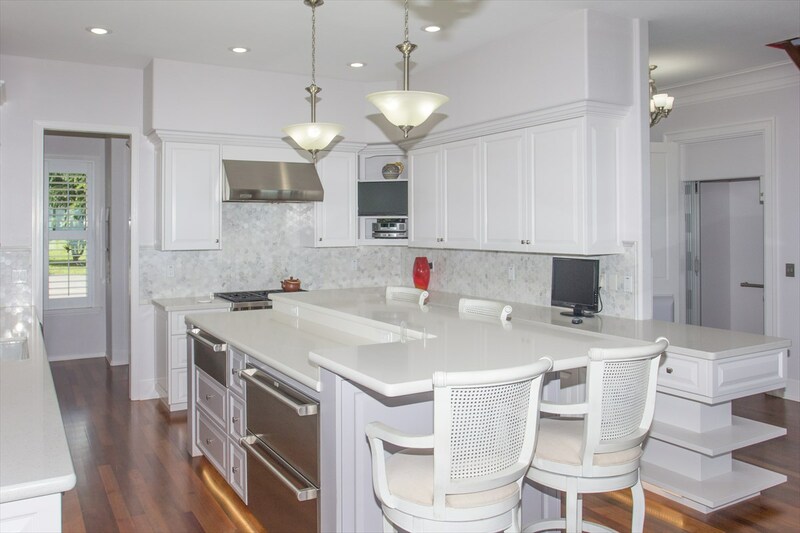 Quartz counters, marble tile back splashes, a Wolf 6 burner gas range, 2 stainless steel Bosch dishwashers and refrigerator drawers, 2 deep sinks and abundant cabinetry make the room ideal. 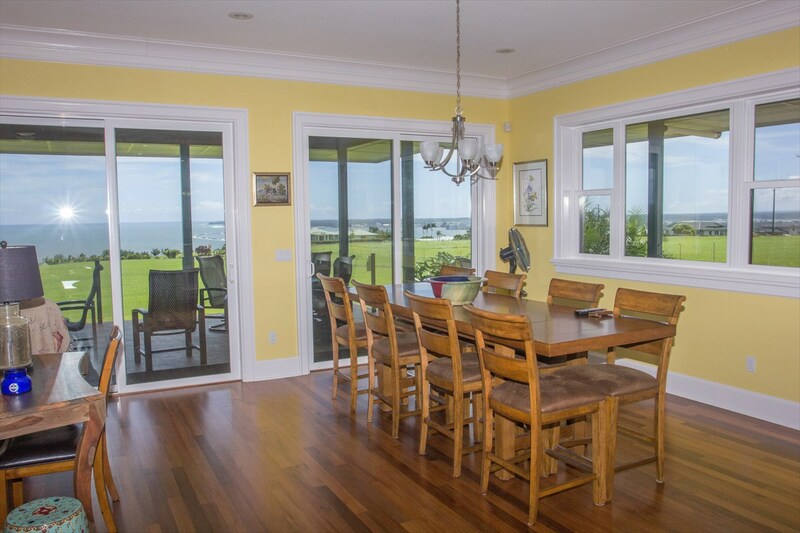 Step onto the 1st floor lanai with a wet bar with wine fridge. On the first floor is the great room, a full bathroom with bubbler tub. 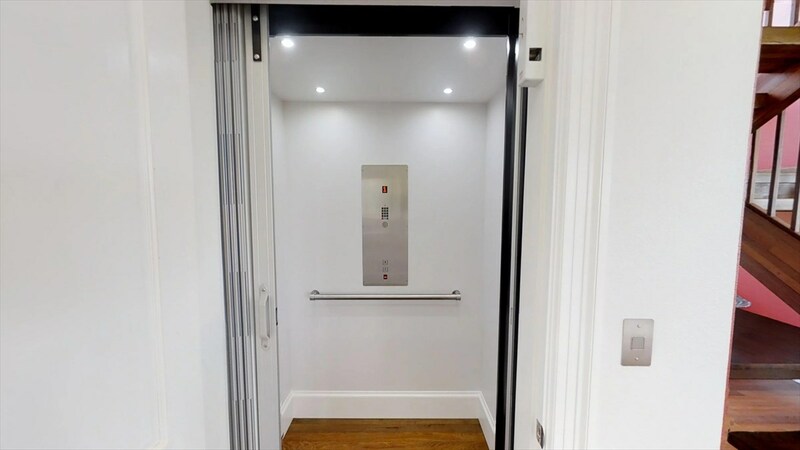 Two people fit comfortably in the elevator making trips up & down effortless. 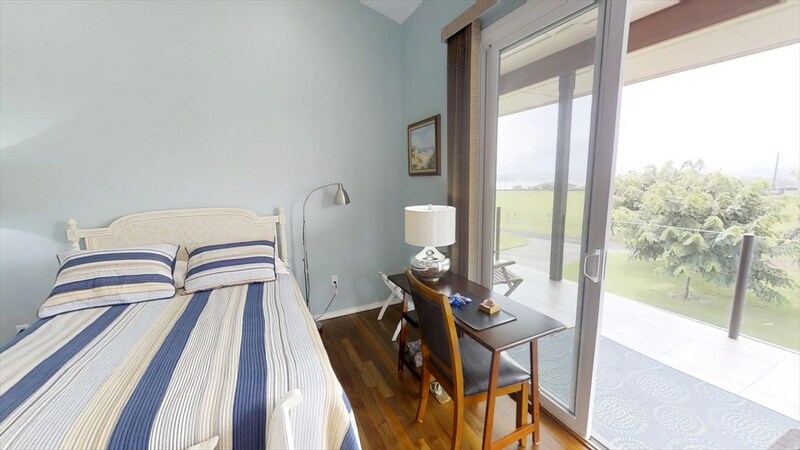 Upstairs is the master bedroom with private ocean view lanai, walk-in closet and cathedral ceilings. 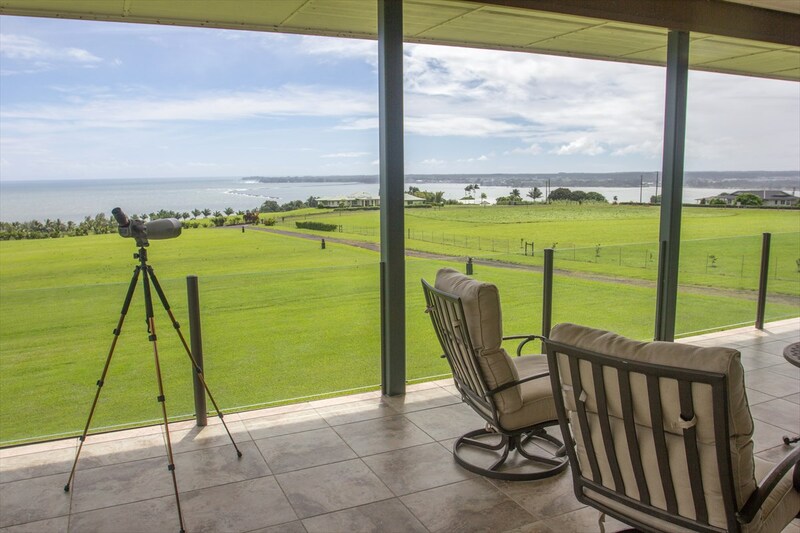 A bird's eye view from the master bedroom lanai. 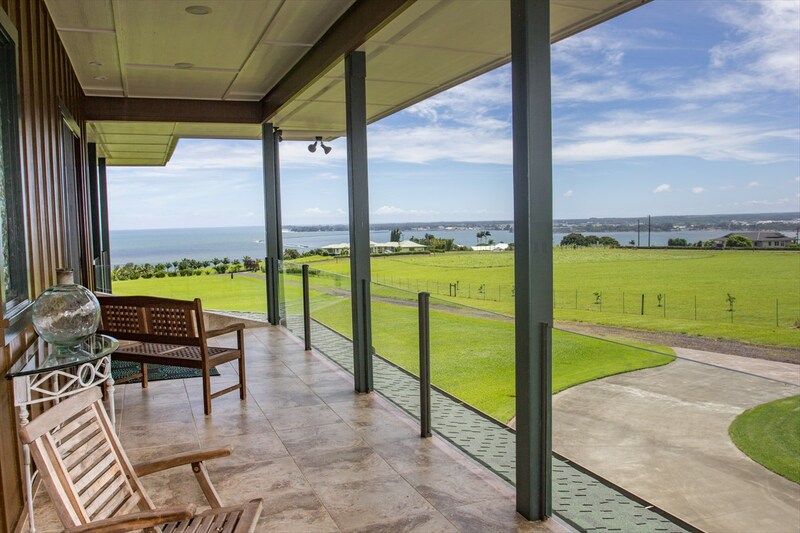 Clear railings make for unobstructed views. 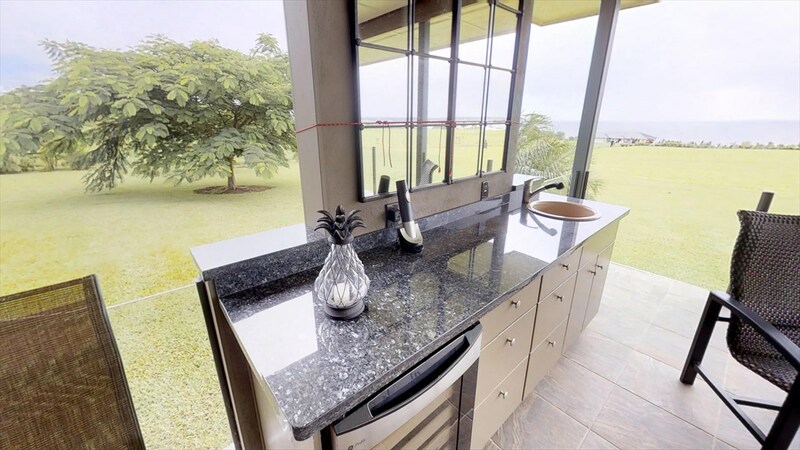 The master bath has a double vanity, and an open-air shower! Why not enjoy the tropical air and the panoramic view while showering? One of the guest bedrooms with an ocean view lanai and Jack-and-Jill bath. 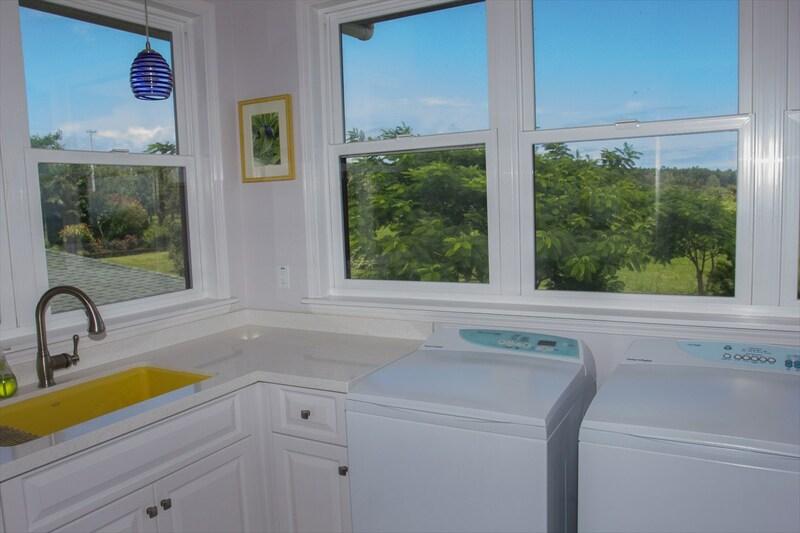 Maybe the most beautiful laundry room that you've ever seen! Enjoy doing laundry! In addition to the 3 car garage is a 2 car carport with dog kennel. The 3-car garage has a bathroom, outside shower, and 2nd washer & dryer. Plans are included with the sale for expansion of this building, should additional living space be desired. 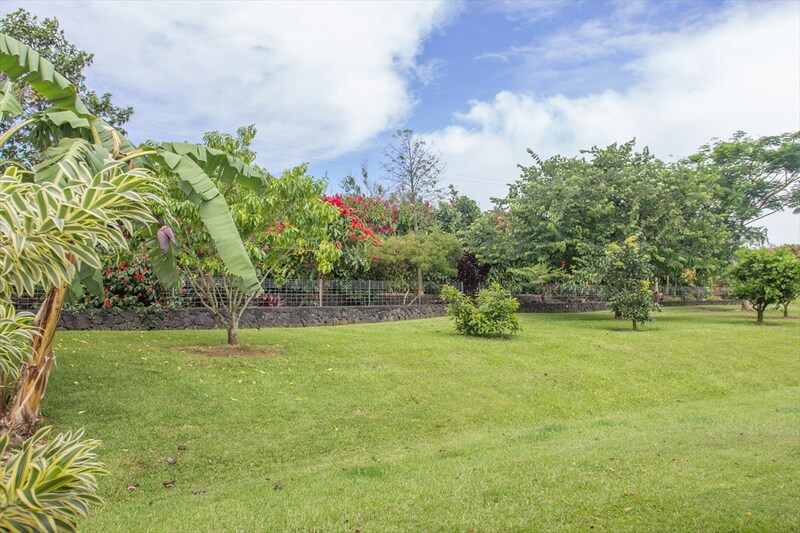 Beautiful landscaped yard with a privacy rock wall, banana trees, flowering trees and much more! 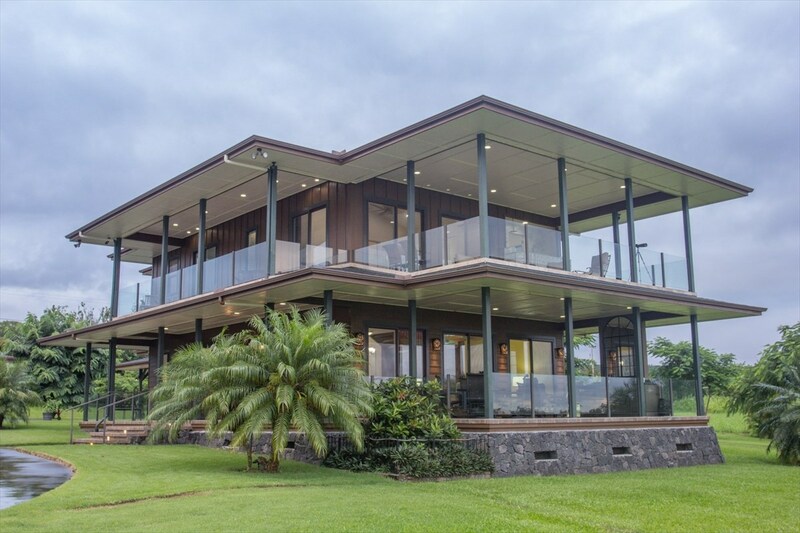 Thoughtfully designed to take full advantage of the view, this 2759 sf home has 3 bedrooms and 3 baths in the main home plus spacious tiled lanais. Majestic Mauna Kea, seasonally snow topped, is seen in the distance. Tropical splendor everywhere. 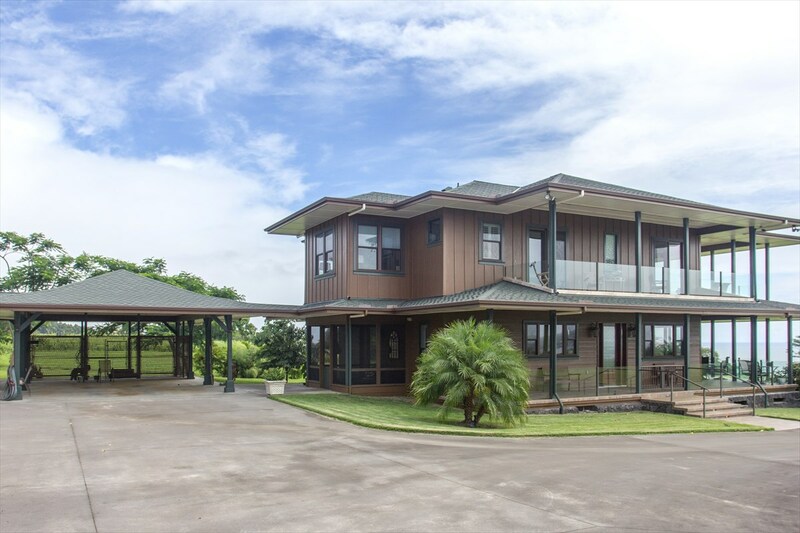 Welcome home and just minutes away from all of Hilo's amenities.